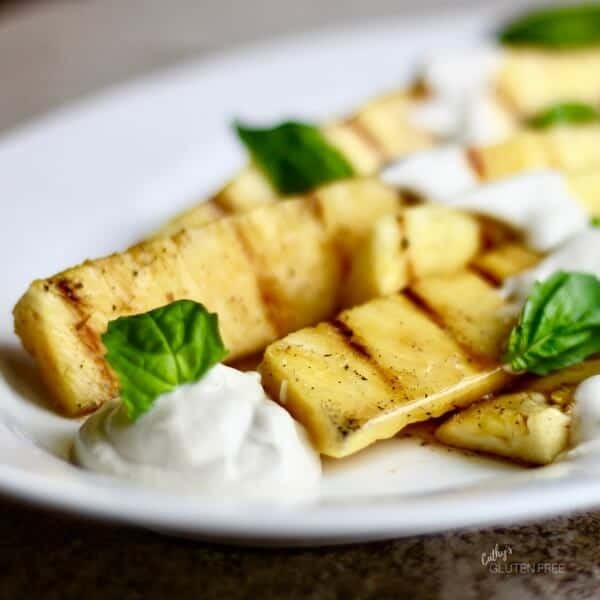 This Simple Grilled Pineapple with Cardamom Maple Syrup will be a tasty, easy side to serve up this summer while you have the grill on. Imagine how awesome this would be with your Easter ham! It’s finally spring according to the calendar! As of this writing, it seems like the area where I live is the only place left that still has snow. Weather forecasts showing temperatures poking above the freezing point for brief periods in the afternoons this week are encouraging! I walked through snow on our deck to shoot the grill portion of the video for this post. Summer grilling season, or barbecue as we call it in Canada, can’t come soon enough for me! If it’s not convenient for you to grill it, you could brown your pineapple a little in a frying on the cooktop or under a broiler in the oven. Those who struggle to cut a pineapple into spears might find this video helpful. I find the easiest way to do it is to cut the ends off and then cut the pineapple vertically into wedges before chopping off the skin and core. I love that this recipe showcases pure maple syrup which is being produced right now in maple forests around me. What could be simpler than stirring a little ground cardamom into it? 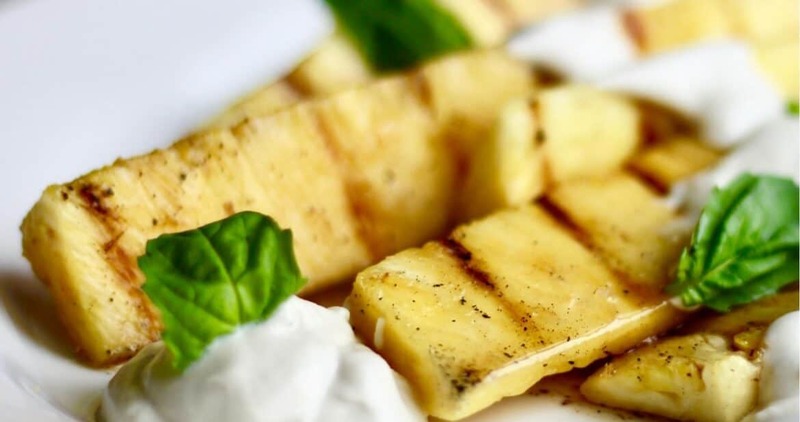 Brush it over your grilled pineapple, and it’s all set to serve! I serve my grilled pineapple with Cashew Yogurt. It’s creamy tanginess compliments the pineapple nicely. If you don’t mind including dairy in your diet and you don’t happen to have a batch of cashew yogurt on hand, you could use a plain, unsweetened Greek Yogurt. Top your pineapple dish off with a little chopped fresh basil for flavour and eye appeal. Cut the top and bottom off the pineapple. Stand it up on a cut end and cut through the centre vertically into 16 long wedges. Cut off the skin and core of each wedge. Grill pineapple on a hot grill for a minute or two on each side until each spear has nice grill marks but is not cooked through. 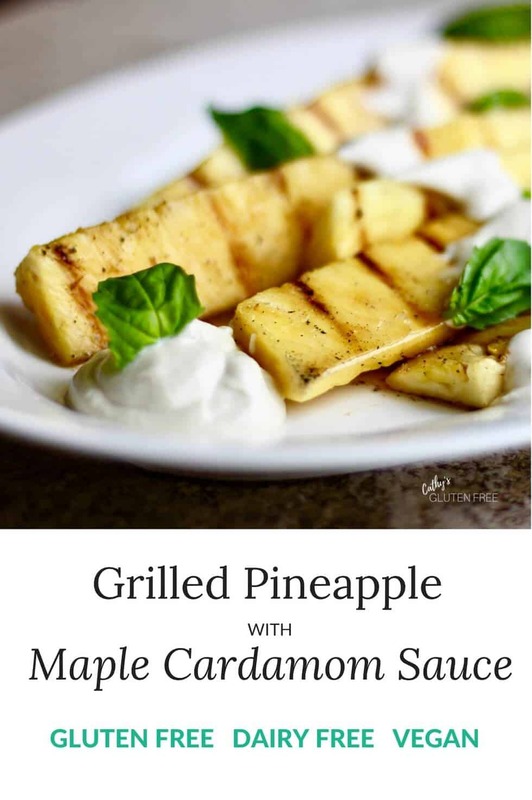 Stir cardamom onto maple syrup and brush over grilled pineapple.